The word stanza comes from Italian and means, loosely, “little room,” which is an apt way of looking at a stanza. 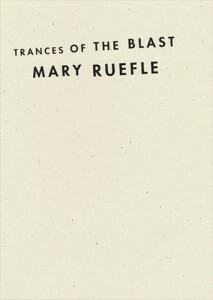 In Mary Ruefle’s work there is another unit of poetic measurement present, often smaller than a stanza, though arguably more energetic, which could be called a “blast.” These moments of clarity, insight, instruction, and radiance have been a feature of Ruefle’s writing for the length of her career (see 2010’s Selected Poems also from Wave Books), but, as evidenced in Trances of the Blast, have become more subtle and opaque over the years, though no less intense. they lie there on the floor. than I spend with myself. It’s the surprise of writing what you didn’t know you were going to write that Ruefle longs for; epiphanies that are genuinely born of the process of composition. The sentence, the complete thing, known before you’ve begun is less interesting. Indeed, the known can spoil an evening. with a house or something. Past is physical, real, and navigable. Is this Ruefle’s own memory? a memory of our own? Is it no memory, simply a thing by which we can examine memory? No matter, we walk through the past with its wall, steps and gardens, throughout the collection. “I hated childhood. / I hate adulthood. / And I love being alive.” So ends “Provenance.” Set apart as its own stanza, this tercet is both “blast” and “little room.” It is a life condensed into the end of a poem, and distilled down to extremes. Ruefle is at her best when working thus, and Trances of the Blast is Ruefle at her nuanced finest. What other poets have continued to delight, “overwhelm and astonish” as they have matured?